Persimmon – Tomato Town organically grows heirloom tomatoes in the greater Kansas City area as well as Johnson County, Leawood, Lenexa, Olathe, Shawnee, Merriam KS, Independence MO and Kansas City Missouri, KCMO. Varieties include: Cherokee Purple, Brandywine, Stupice, Carbon, Black Krim, Black Cherry, Yellow Pear, Absinthe and Aunt Ruby’s German Green. Our Persimmon plant is covered with slightly lumpy, distinctively golden fruit. 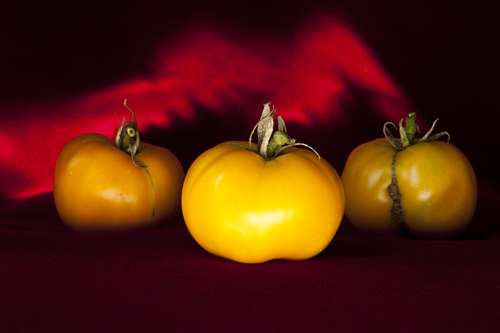 Of all the orange tomatoes we have experimented with, this one has the best taste. The flesh is delicate, yet firm and meaty. There have been a few websites that place this tomato in Thomas Jefferson’s garden, but we have not been able to confirm it with a reputable source. This entry was posted on Saturday, July 7th, 2012 at 1:30 pm. It is filed under Varieties. You can follow any responses to this entry through the RSS 2.0 feed.